Save the Date for our 18th Annual Chamber Open! Click here to register for our 18th Annual Chamber Open! Another Great Chamber Open! 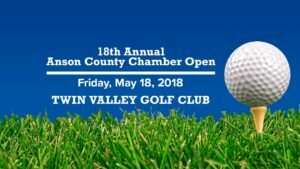 The Anson County Chamber of Commerce held its 17th annual “Chamber Open”, on Friday April 21st at Twin Valley Country Club. With teams booked and many volunteers lined up, everyone was prepared for a great tournament. Players had their choice of an 8:00am or 1:00pm tee time, and with great weather scheduled, it was sure to be a great day for golf! The Anson County Chamber Open would not be as successful as it is without the support of the sponsors, volunteers and especially the golfers. Shelby Emrich, Executive Director, thanked all of those who donated to this year’s tournament; Coca-Cola, Pepsi, Tyson Foods, Refreshment Services Inc., Oliver’s Restaurant, Uwharrie Bank and IGA of Wadesboro. She also thanked Tommy Bricker for cooking all the chicken. There were many others to thank for their contributions to the event such as, Rep. Mark Brody for being the Lunch Sponsor. Much appreciation went to Ambassador Health and Rehab of Wadesboro and H.W. Little Hardware for being the Raffle Sponsors. Several folks donated goodie bag items; Plank Road Realty, Lifetouch, Carolinas HealthCare System, Pee Dee Electric, South Piedmont Community College’s Small Business Center and Anson Health & Rehabilitation, which were certainly appreciated as well as those that sponsored teams and hole signs. The Drink Cart Sponsors this year were Anson Family Optometric and Kiker Resource Management. The Hole In One Sponsor was Anson Health and Rehabilitation. A huge thanks went to Pee Dee Electric for the use of their bucket truck for the Ball Drop which is always a fun event at the tournament, and Chris Baxley of Pee Dee for operating it. Emrich also thanked Jacob Thomas for coming to lend a hand and the staff at Twin Valley Country Club for their support. “I have to give huge thank you to Megan Sellers, Administrative Assistant for the Chamber, for all her work to help make the golf tournament a great success” stated Emrich. She also thanked the Golf Committee; Brandon Chewning, Ashley Hayes, Jeremy Taylor, Josh Bricker, Todd Moore, and Ryan Teal. Emrich went on to say that without these wonderful volunteers this event would not be as successful and she appreciated each one of them. She also gave a big thanks to Scott Collier and the 2017 Leadership Anson Class for helping out as well. “I also want to thank the Chamber Board of Directors for all their help and support”, Emrich stated. Winners; First place winners of the tournament were, B & B Pest Control (Barry James, Alan Hildreth, Darrell Poe & Fred Sparger), in at second was Wadesboro Tire & Automotive (John Martin, Jay Vernon, Johnny Martin and Ronald Diggs) and coming in third was Anson County Sheriff’s Office (Brian Tice, Josh Beam, Todd Pegram and Brett Hildreth). The winner of the Split-the-Pot was Donnie Yarborough. The winner of the “Golf Ball Drop” was Marty Godwin. Longest Putt went to Chuck Horne for the afternoon. Longest Drive went to Todd Moore for the morning and Todd Pegram for the afternoon. Closest to the Pin was Bobby Talton for the morning and Carlton Tyson for the afternoon. This year’s raffle winners were Joel Fox for the grill and the set of rocking chairs went to Charles Bailey. New this year was an adult beverage basket donated by Jeremy Taylor of Plank Road Realty; winner of the basket was Adam Emrich. Congratulations to all of the winners! “Thank you all so very much for the support to continually make this event the success that it is,” Emrich stated.